Information on behavior, environment and reproduction of red-eared sliders in the wild. This site has some of the wonderful pictures I linked to on the Photo Gallery section. 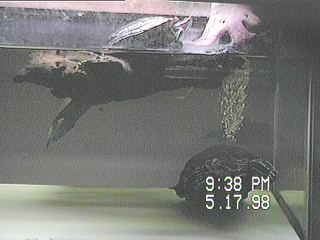 This is an amazing site where you can observe Red-Ear Sliders through a net camera. There is also a page to meet the turtles and other information on how the camera works, etc. Very interesting! A forum where you can make questions about Red-Eared sliders. SHELL SHOCK! Another great Red-Eared Slider link! 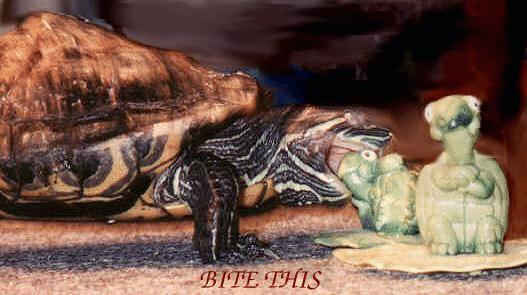 Information on feeding, living with a turtle and children, other pets, wild turtles, etc. Comme visit Pinto, a Trachemys Scripta Cataspila (Huastecan slider). At this site you will also find general caresheets for aquatic turtles. Come see Elmer! The last Woolworth turtle! A website about Red Eared Sliders in Danish! Great information about how to breed Red Eared Sliders! 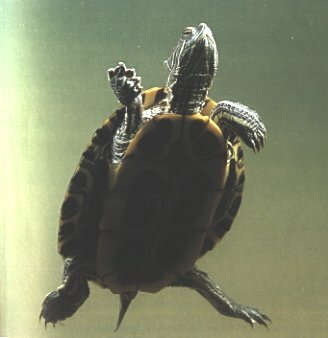 Information about the general care, feeding, housing, etc of Red Eared Sliders. Some general information about Red-Eared Sliders. Caresheets in italian, beautiful pictures! Excellent information on origins, description, feeding, housing, transporting, hibernating, diseases and links for Red Eared Sliders. Great guide on how to take care of Red Eared Sliders. This site also includes a Forum totally dedicated to red eared slider turtles! Red-Eared Slider caresheets. This is the only caresheets site that I have found in spanish so far, although I don't agree at all with the diet they recommend. Ignore their diet advise.